The last half of the 20th Century was one of the few times in human history when a war was described by what did not happen rather than chronicling a number of armed conflicts. 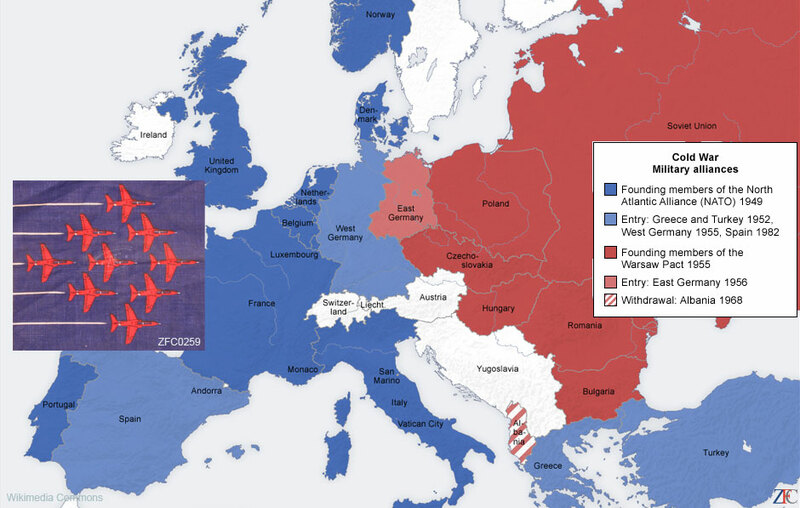 Between 1946 and 1992 various nation states aligned themselves behind rival ideologies. The two dominant factions, the West represented by the North Atlantic Treaty Organization (NATO) and the Soviet Bloc organized as the Warsaw Pact, attempted to either persuade or force other nations into their camps. Both side used economics, intimidation, propaganda and the threat of armed conflict utilizing new revolutionary weapon systems, which if used meant the end of civilization. Presented here are a selection of the colors, guidons and flags of the U.S. military from the Cold War era that formed a part of the U.S. component to NATO. Since the ability to deliver horrific weapons by air were an integral part of Cold War strategies new types of combat units were formed in the 1950s and principal among them was the U.S. Air Defense Artillery. Here one may view an artillery group color as well as battery guidons from that corps. Included in the Grouping are period ensigns and flags from many of the principle NATO nations; some ceremonial flags of the two services that projected NATO’s power, the U.S. Navy and Air Force.